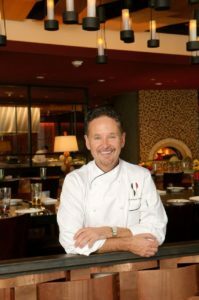 Stephan Pyles is a pioneer of New American Cuisine and founding father of Modern Texas Cuisine. A fifth generation Texan, Pyles has opened 22 restaurants in 5 cities over the past 30 years. His newest restaurant, Flora Street Café, was awarded “Restaurant of the Year” by D Magazine, The Dallas Morning News, The Dallas Voice was just named Texas’s Best New Restaurant by Texas Monthly Magazine. He has authored four highly successful cookbooks and hosted two seasons of the Emmy Award-Winning PBS series New Tastes from Texas. A multiple James Beard Award winner and Esquire’s Chef of the Year, Pyles has cooked for dignitaries and celebrities from around the world, including five American presidents and HRH Queen Elizabeth II. In May, Chef Pyles will be inducted into Nation’s Restaurant News’ “Menu-Masters Hall of Fame” in Chicago. A tireless philanthropist, Pyles is a founding board member of Share Our Strength and was recipient of the organization’s “Humanitarian of the Year” award. He is a Life Board member of the North Texas Food Bank and co-founded The Hunger Link, Dallas’ perishable food program. Pyles has given $250,000 in culinary scholarships in his name over the past decade.